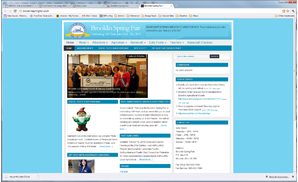 Ahead of its 100th anniversary, Brooklin Spring Fair redesigned its website on a brand new WordPress platform. Brooklin Spring Fair is Ontario’s oldest running town fair featuring events in agriculture, education, competitions, parades, and more. Textual content from the original site was imported into the new WordPress platform using its built in CMS. Features a unique WordPress theme, form builder, and a customized shopping cart allowing users to select events they would like to join.